So, what a lovely and busy weekend of car boots we had last week people! We are just loving this weather to put car boots in Lancashire on the booty map!! 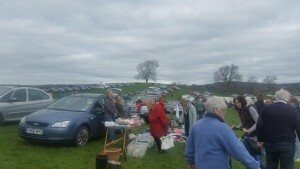 One of our other car boots in Lancashire is the A6 car boot in Carnforth. This car boot finally got off the ground with a rain/sludge/mud-free weekend that meant that our ground was ready to rock and the weather was smiling down kindly on us yay!! We had a great response to this boot – and it was lovely to see so many people doing car boots for the first time and really enjoying it. The tea room was a welcome sight for many and our griddle was hard at work making sure hungry tummies were full and ready to buy/sell. We’ve got our fingers crossed for lots more lovely weather this season now so that we can all get together and get those car boot bargains up and running for everyone. Thank you so much to everyone who came and bought/sold, we appreciate every single one, as this is what makes our car boots such happy and fun places to be. We just love putting on car boots in Lancashire! !